But it's not me! LOL!! I'm afraid that ship has sailed all it's voyages. Actually I don't know anyone who is having a baby. 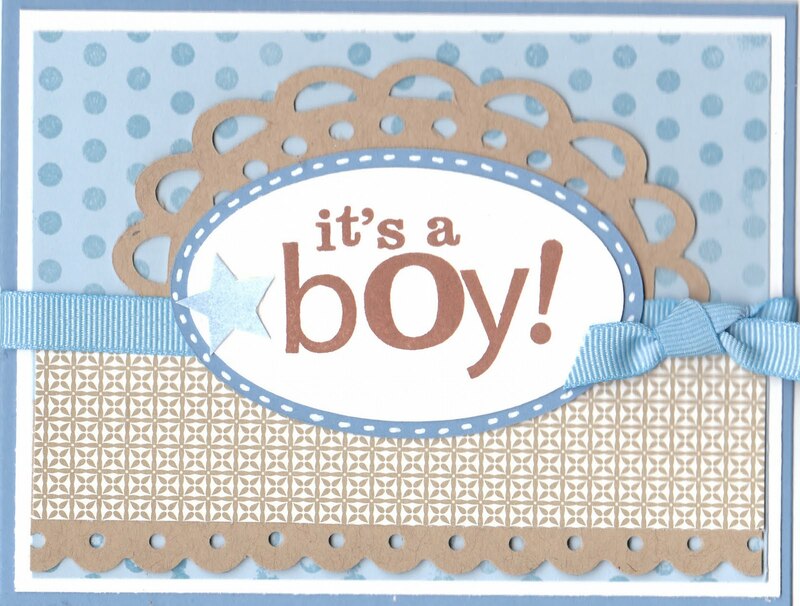 However, when I decided to use these colors together from PTI, how could I not make a baby card?! I'm sure someone I know will have a baby and I'll be able to use it. I used Blueberry Sky, Spring Rain, White and Kraft for my color combination. I used yesterday's Tuesday Morning Sketch. I'm also continuing my theme of embossing this week as well. I stamped a Polka Dot background stamp from Inkadinkado with versa mark and embossed with clear powder for the background behind the kraft oval. The oval was cut using the Lacy Circle Digital Cutting kit with my Cricut. 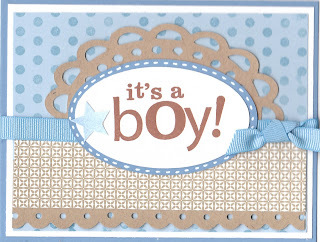 The sentiment in the middle is from another Inkadinkado set called "Baby Boy"
Fabulous baby card! Whoever is having a baby will be very lucky to get this one. Thanks for joining us at Tuesday Morning Sketches.